This profile originally appeared in the 2018-19 Giving Guide. Read the full magazine here. The Ottawa Network for Education (ONFE) is a non-profit charitable organization that collaborates with community partners and works side-by-side with educators to bring innovative and essential programs into K-12 schools. 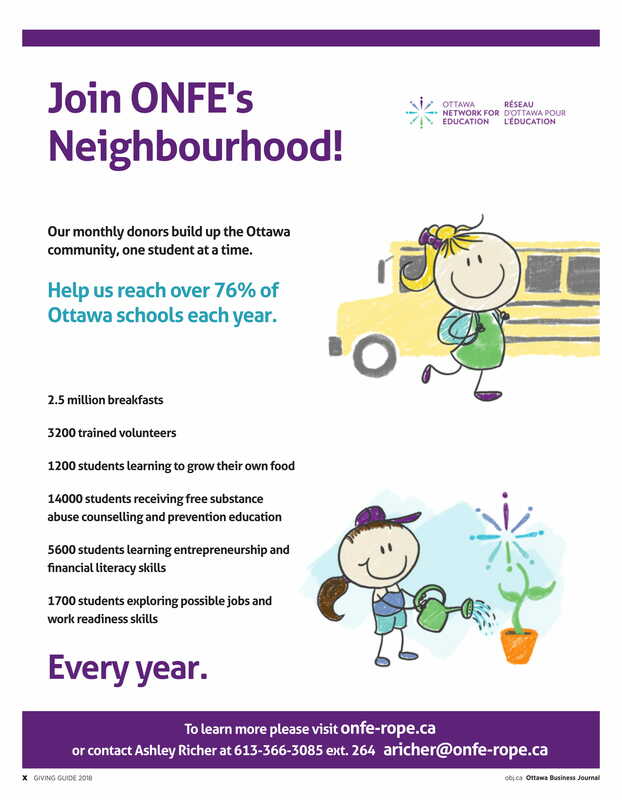 ONFE strives to remove barriers to learning and provide solutions to critical issues such as student hunger, early literacy, numeracy deficits and substance abuse. ONFE also provides students with the opportunity to develop financial literacy, entrepreneurial thinking and work-readiness skills. Your donation today will set the stage for student success tomorrow. Your gift will address critical issues facing children and youth, remove barriers to learning and prepare local students for post-secondary success. Our donors and partners play a significant role in ensuring our financial sustainability. They also share our vision for the future and want to invest in programs that will equip today’s students with the skills, experience and knowledge they’ll need to succeed in post-secondary education and fulfilling careers. Connect with us to discover the opportunity that is right for you. Align your business with ONFE and give local students the chance to soar! The Ottawa Network for Education helps students succeed by tackling issues that create barriers to learning and have a negative impact on student well-being. Your donation will fund programs that remove barriers such as hunger, inadequate nutrition, skill deficits and substance abuse; and support students’ learning, skill development and career preparation. During the 2017-18 school year, we placed 3,240 volunteers in Ottawa schools. These volunteers provide vital support to students to help meet their complex needs. Together with teachers, our volunteers help students build core skills, grasp new concepts, close learning gaps and develop greater self-confidence. Volunteers tell us that helping a student is one of the most fulfilling things they’ve done. Teachers tell us that caring volunteers make an immense difference to children in need of extra support. Our annual gala, the Spark Soirée, hosted in October, will engage you and your company in an evening of entertainment and networking with other community-minded individuals and business professionals, as well as executives from Ottawa’s four school boards. You will be recognized as a company that cares about student nutrition and a company that invests so every child in Ottawa starts the school day ready to learn, and on equal footing with his or her peers. Vice-president, leasing and operations, Glenview Management Ltd.